I've been listing today in my new Etsy store, Vintage Jewelry Lane. 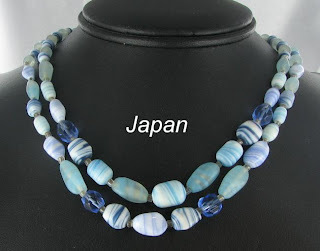 Just had to give a sneak peek at this lovely necklace from Japan. It is so romantic and feminine and the perfect color choice for Summer. It's set in silver tone metal and has the most lovely combination of glass and art glass beads in such a pretty combination of blues. Just $24. Only one available. English and European art glass is well represented by names like Webb, Stevens and Williams, Lalique, Daum, Galle, Baccarat, Val St. Lambert, and Venetian glass from Murano.